February 27, 2018 (Boulevard) – The Boulevard Planning Group meets Thursday, March 1st at 7 p.m. in the Boulevard Fire Training Room, 33919 Ribbonwood Road, Boulevard. The board is expected to take action on proposed release of a sexually violent predator on McCain Valley Road. The board will also receive updates and hold discussions on issues including Supervisors’ climate action plan, Tule Wind noise complaints, Protect Our Communities’ appeal challenging federal approval of Tule Wind phase II, and revival of two solar projects formerly proposed by Soitec. Rugged Solar has been taken over by Clean Focus and Tierra Del sol Solar has been taken over by Invenergy and renamed Boulevard Solar. January 9, 2016 (Boulevard) – Efforts to block the massive Rugged Solar project in Boulevard appear to have hit a dead end. On December 11th, Judge Wohlfeil confirmed his tentative ruling to dismiss a writ of mandate filed by Backcountry Against Dumps (BAD). The challenge claimed the project violated California Environmental Quality Act (CEQA) requirements on groundwater and fire issues, among others. Photo: SOITEC panel at Newberry Springs, similar to panels approved for Boulevard. October 16, 2015 (Boulevard) – By a 4 to 1 vote with only Supervisor Dianne Jacob opposed, the Board of Supervisors this week approved a revised version of the controversial Rugged Acres industrial solar facility and rescinded approval of an earlier plan. A judge had tossed out the original environmental impact review because massive battery storage facilities were added after public comment was closed. Supervisors approved a revamped plan with the energy storage facility removed. July 31, 2015 (San Diego) – East County Magazine picked up three more awards from the Society for Professional Journalists San Diego pro chapter last night during the annual awards banquet at the Bali Hai restaurant. Two of the awards honor coverage on our East County Magazine Show on KNSJ Radio while the third is for an investigative report at our online news site (www.EastCountyMagazine.org), bringing our total awards to 83 since our founding in 2008. Last night’s honors, all second place awards presented to Miriam Raftery (photo, left), include our radio interview series with local Chaldeans’ efforts to halt genocide in Iraq, a radio interview with a Kurdish woman about her family’s ordeal fleeing ISIS, and an online investigative report on a San Diego company’s failure to disclose negative impacts of a proposed energy project. May 24, 2015 (Sa Diego) – Soitec launched its solar manufacturing facility in San Diego with a $25 million federal grant. The company touted its cutting edge, utility-scale solar collectors as ultra-efficient. But now the French-based company has announced it is selling off its manufacturing facility in Rancho Bernardo and other solar assets. The buyer is ConcenSolar. The deal includes all technology assets, manufacturing operations in Freiburg, Germany and San Diego, a company press release indicates. February 12, 2015 (Boulevard)--When Dave Roberts was elected to replace retiring Supervisor Pam Slater-Price, I had hoped he would live up to his campaign claims of being community oriented and environmentally aware. Instead, Roberts has voted several times against Supervisor Dianne Jacob, over her well-reasoned objections to harmful projects in her District 2, and over well-documented community concerns, in order to support the financially biased and factually challenged claims made by vested interests and politically-pressured-County Staff, that these massive wind, solar, and transmission line projects are actually needed, are sustainable, and are compatible with rural community character and existing uses. February 12, 2015 (San Diego's East County)--Six days after Supervisor Dave Roberts voted for the highly controversial Soitec industrial-scale solar projects in Boulevard which were approved 4-1 on February 4th, he sent supporters an e-mail with an invitation to a fundraiser for his campaign at the La Jolla home of Jim Waring, co-founder of CleanTech San Diego. Waring lobbied and testified on behalf of Soitec, which has a manufacturing facility in San Diego, at the Feb. 4th hearing. Co-hosts of the fundraiser also include Jim Whalen, whose firm, J. Whalen and Associates, represents Sempra Energy and Hamann Companies. Hamann owns land on which the Soitec projects are slated to be built. Whalen, too, testified before Supervisors on February 4th and other occasions in favor of the Soitec projects. These cozy ties raise a serious question: just how impartial was Roberts when casting a vote to scrape bare more than 1,100 acres of habitat in East County including land along a scenic highway, putting a town’s groundwater supply at risk as two hydrologists have warned, and increasing fire danger with an unmitigatable fire risk as Supervisor Dianne Jacob observed? Whose interests was Roberts really representing? Note: Tune in Friday to our radio show on 89.1 FM from 5 to 6 p.m. to hear interviews with Boulevard residents and a hydrologist sharing their views on this outcome. Jim Whelan, a representative of Soitec project property owners Hamann and Gibson was invited and refused to participate. February 4, 2015 (San Diego) – Boulevard residents fought down tears in stunned disbelief today (photo, left) as San Diego Supervisors voted 4 to 1 to approve Soitec’s Tierra Del Sol and Rugged Solar projects, overriding a unanimous vote by Boulevard’s elected planning group that opposed the projects. 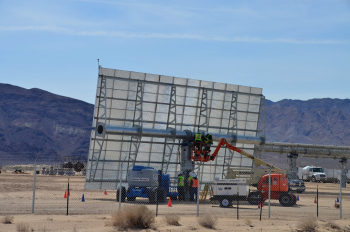 Collectively the two massive projects will cover 1,185 acres (the equivalent of 185 city blocks) of rural terrain with thousands of concentrated solar tracking panels, each 48 feet wide by 30 feet tall. Only Supervisor Dianne Jacob voted against the project, following an extensive speech in opposition. She called county staff’s finding that the project was compatible with rural community character “absolutely incomprehensible to me.” Jacob pointed out that the General Plan is supposed to assure environmental stewardship, preservation of agricultural lands, open space and community character, among other qualities – all of which will be destroyed if the Soitec projects are built. January 24, 2016 (Campo)—The Campo Lake Morena Planning Group meets Monday evening at 7 p.m. The agenda includes a staff update and vote on the latest version of the Star Ranch plan. Officers will be elected and vacancies on the board filled. In addition planners will discuss concerns raised by Boulevard and Jacumba planners over the addition of large battery storage facilities at the proposed Soitec Solar project. To view the full agenda, click “read more” and scroll down. January 23, 2015 (San Diego)—Soitec Solar may exit the solar business, Greentech Media reports. A quarterly report indicates the company plans to “refocus” efforts on its electronics business . The news comes as San Diego Supervisors are poised to vote Feb. 7 on whether to approve massive industrial solar projects proposed by Soitec in Boulevard. January 19, 2015 (Boulevard) – Rural planning group chairs and environmentalists are blasting county planners for approving Soitec Solar’s controversial industrial scale solar projects. Planners largely ignored evidence that the projects could deplete groundwater supplies, threaten wildlife and create fire hazards—as well as Soitec’s precarious financial position. Next up, San Diego Supervisors will hold a hearing on the project February 4th. At least one citizens’ group, Backcountry Against Dumps (BAD) has promised to file a lawsuit against the County if Supervisors approve the projects, which would cover 1500 acres with approximately 8,000 massive solar trackers, each 30 feet high. Despite company’s woes, county releases EIR on Soitec’s proposed Boulevard projects. A hearing is set for January 16, with the deadline for public comment January 14. Despite this precipitous news, ironically the County of San Diego released the final environmental impact report (EIR) on Soitec’s four proposed industrial-scale solar projects in Boulevard. A hearing on the projects are set for January 16th, which public comments due by January 14th at 4 p.m. , according to Mindy Fogg, planning manager for the County. August 8, 2014 (Boulevard)—Donna Tisdale is the elected chair of the Boulevard Community Planning Group and has long been a champion fighting for rights of rural residents against an onslaught of industrial-scale development proposals. So why did Soitec Solar snub Tisdale in three invitation-only meetings with residents on Soitec’s controversial industrial-scale solar projects in Boulevard, held at a private ranch? ECM special investigative report on Sheriff response times. How safe is your community? Solar leader Daniel Sullivan says "absolutely" industrial wind/solar projects in our backcountry are not needed. We can produce more clean power for less money AND save our scenic areas. Find out what must change to stop this senseless devastation. Frank Tsimboukakis, candidate challenging State Senator Joel Anderson, takes stand against big energy projects in our region and shares his plan to eliminate tuitions at public universities and colleges in California. Ariele Johannsen’s Destination East County tells you about the hottest events coming up—from a glow-in-the-dark egg hunt to Lakeside's Western Days, a wine-and-rails ride through our backcountry and many others. All this and more on this Wednesday's East County Magazine show! You can listen online at the link above (it may take a few moments to load, after you click the play button) or on KNSJ 89.1 FM at 5 p.m. Wednesday. April 5, 2014 (San Diego) –“The San Diego County Planning Commissioners and Board of Supervisors have an obligation to look out for the greater good of the people of San Diego,” Timothy D. Schoechle, PhD, an international consultant on smart grid expert technology, engineering expert, and author of the report Getting Smarter About the Smart Grid wrote in his comments to the County’s planning director opposing Soitec’s plan to industrialize rural East County with massive solar modules that other experts have said could destroy the entire ecosystem of the region. Instead, Dr. Schoechle lays out a detailed case for a saner, safer alternative—and why current government policies are polar opposites of what’s needed to protect the public against rapacious energy corporations. April 1, 2014 (San Diego’s East County) – Soitec’s four proposed solar projects on 1,490 acres in the Boulevard area of East County could negatively impact migratory birds, eagles, endangered butterflies and wildlife corridors, Karen Goebel, assistant field supervisor with the U.S. Fish & Wildlife concludes in a comment letter sent to the County regarding the projects’ draft Enviornmental Impact Report (DEIR) on March 11, 2014. The letter also indicates studies have been inadequate and cumulative impacts of projects across a broader area need to be evaluated. March 17, 2014 (San Diego’s East County) – Could big energy projects proposed in East County lead to the decimation of federally endangered Peninsular Bighorn Sheep? From 1972 to the present, the Carrizo Gorge band of these bighorns has plummeted from about 120 sheep to less than 40. “Off-road vehicles, trespassing cattle, poaching in the 1960s and ‘70s, drought, disease and Mountain Lion predation have worked together to push this population o the edge. We hope we can save this group before it is too late,” Mark Jorgensen, advisor to the Bighorn Institute and former Superintendent of Anza-Borrego Desert State Park wrote in the Desert News. In his comments submitted on four solar projects proposed by Soitec in Boulevard, Jorgensen writes that “Construction of yet another group of solar projects will further impede the free movement of wildlife by reducing habitat connectivity and ruining wildlife corridors.” He further notes that Soitec’s sites are very near lands purchased and set aside specifically to protect species the endangered bighorn, golden eagles and other species in peril. Why doesn’t San Diego County end revolving door situation? Photo: Soitec's Newberry Springs project, which promised minimal enviornmental impacts, graded all vegetation on the site. March 1, 2014 (San Diego’s East County)—Developers frequently put “spin” on project descriptions to emphasize benefits rather than negative impacts. But certain statements by Soitec representatives regarding its proposed solar projects in Boulevard and a recent project in the desert fall into the “Pinnochio” category. In fact Soitec representatives misrepresented glare issues and the amount of land that is disturbed by their projects. Soitec's Hutchens concedes that she erred in her statement on the timing of the moratorium, and agrees it was imposed after Soitec's project was built, but says Soitec's project was not the reason for the moratorium. ECM is seeking clarification from San Bernardino County's Land Services Department. That's not the only disputed statement by Soitec. February 15, 2014 (San Diego’s East County)—The Anza Borrego Foundation (ABF) and a law firm representing the Cleveland National Forest Foundation (CNFF) have submitted comments warning of dire consequences from Soitec Solar’s proposed massive solar projects in the Boulevard community. Both urge the County to put the brakes on the proposed projects, which they warn would cause irreparable harm to wildlife and ecosystems not only in rural Boulevard, but in Anza Borrego State Park and Cleveland National Forest. February 13, 2014 (Boulevard) -- The County has announced it will extend the deadline to March 3rd for public comments on Soitec Solar's draft programing environmental impact report for four industrial-scale solar projects proposed in rural Boulevard, following an overwhelming public response during the initial comment period. The bulk of those responses were highly critical of the projects, some casting doubt on water estimates made by project consultant Dudek, which has severely underestimated water usage recently on several other high profile projects. Others voiced concerns over impacts on wildlife, view sheds, and loss of rural character. DOES BOULEVARD HAVE ENOUGH WATER FOR SOITEC’S SOLAR PROJECTS? February 9, 2014 (Boulevard)—Hydrology experts are casting serious doubts about the credibility of water use claims made by Soitec Solar for four massive solar projects proposed in San Diego’s rural East County. Read more about DOES BOULEVARD HAVE ENOUGH WATER FOR SOITEC’S SOLAR PROJECTS? February 10, 2014 (Boulevard)--Yesterday, we reported how three authorities state Soitec's consultant is wrong, Boulevard does not possess enough water for their proposed solar project. Now a video from the February 6 community meeting, at Boulevard, reveals that Soitec's consultant, Dudek, recently underestimated the amount of water needed at SDG&E recent ECO substation project by more than three times what would be the final total. (The original estimate was 30 million gallons and the actual amount was closer to 100 million gallons.) Dudek is also alleged to have seriously underestimated the amount of water needed for the Ocotillo Wind Project. If this is true, how can we assume that Dudek's estimates for the Boulevard project are correct? Left--Soitec's project in Newberry Springs scraped bare the earth and emits glare, despite company claims to the contrary. Right--Shaded meadows with mature trees currently support a rich abundance of wildlife as well as grazing livestock. Soitec proposes to put over 8,000 panels on some 1,700 acres here in East County. Residents have launched an online petition asking Supervisors to save their wildlife, water supplies, wild and scenic places. and put solar in urban environments instead. You can read the petition and sign it here. January 30, 2014 (Boulevard) -- Is a "green" energy project really green if it destroys these beautiful scenes? Soitec wants to industrialize our backcountry with over 8,000 solar panels, each 30 feet high, scraping the earth bare and destroying sensitive wetlands and wildlife habitat. Thanks to Teresa DeGroot for documenting what will be destroyed unless Supervisors vote down this project, one of several industrial-scale energy projects proposed as part of the "energy zone" that elected officials seek to create in East County's rural and wilderness areas. Area residents want to see green energy projects located in urban areas where power is used--not in pristine areas such as these that are located along state designated scenic highways. Click "read more" to view more photos. January 5, 2014 (Boulevard)--On Thursday, January 2, the County of San Diego released an Environmental Impact Report (EIR) on massive solar projects proposed in East County by Soitec Solar (http://www.sdcounty.ca.gov/pds/ceqa/Soitec-Solar-EIR.html). At the Boulevard Planning Group meeting, County employees made a brief presentation of the EIR. The small community room was packed with over two dozen residents of Boulevard, all expressing major concerns with the proposed projects. Robert Hingtgen and Mindy Fogg from the County’s Planning and Development Services discussed Soitec’s four proposed projects, which combined would encompass a total of 1,490 acres in Boulevard, with almost 7,500 solar trackers, each measuring 30 feet tall by 48 feet wide. January 27, 2013 (Boulevard ) – More than 100 people packed into the fire station in Boulevard, voicing concerns, questions and outrage over plans to transform their rural community into an industrialized energy zone covering thousands of acres. By meeting's end, it was clear that rural residents - buoyed by supporters from major activist and environmental groups in San Diego -- are gearing up for the fight of their lives. 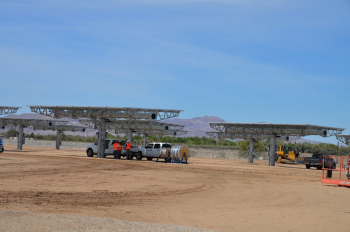 December 20, 2012 (Boulevard) –Soitec Solar has applied for amendments to the Boulevard Community Plan in order to build for commercial/industrial-scale solar projects totaling 8,938,000 square feet (over 1,400 acres) of concentrating solar PV. The “super modules”, each 30 feet tall, would track the sun to produce renewable energy. The largest of the projects, Rugged Solar, is proposed for property owned by Hamann Companies of El Cajon. March 18, 2012 (San Diego) – The future is sunny for solar energy. Price parity with conventional energy sources has now been attained in some areas as demand rises and the cost of solar falls. California has emerged as a national leader in the shift to solar--with San Diego at the helm. February 28, 2012 (San Diego)-- San Diego leads the nation in rooftop and on-site solar installations. According to a recent report from e Environment California Research & Policy Center, over 4,500 installations and 37 MW peak capacity for the city--15,700 installations—have been made within San Diego Gas & Electric’s service territory. Now the Solar Electric Power Association (SEPA), CleanTECH San Diego and San Diego Gas & Electric (SDG&E) are offering a solar energy symposium on March 6 at the University of San Diego to discuss the future of solar energy in the region.